Medicine has greatly evolved since male students at Geneva Medical College in New York first voted to admit a female student as a joke. When she showed up for class, the men were stunned into a “death-like stillness.” But in 1849, that woman, Elizabeth Blackwell, became the first female to earn a medical degree. Today, women are equalizing the medical school playing field in the U.S. — a major improvement since 1949, when only 5.5 percent of medical school enrollees were female, or even since 1974, when that percentage climbed to 22.4. For the first time, more women have enrolled in medical school than men, with women representing 50.7 percent of new students in 2017. Pay: Women in medicine earn significantly less than men. The median annual income is $253,042 for white male physicians, $188,230 for black male physicians, $163,234 for white female physicians and $152,784 for black female physicians, researchers reported in the June 2016 issue of The BMJ. Salary differences exist even after factoring in age, experience and specialty, according to JAMA Internal Medicine. Leadership: At the top 50 medical schools funded by the National Institutes of Health, only 13 percent of the clinical department leaders are women, according to a 2015 study in The BMJ. Recognition: Major medical societies in dermatology, neurology, anesthesiology and surgery had zero or near-zero female award recipients, say researchers in a 2017 analysis published in PM&R. Diversity: In the U.S., women of color made up only 11.7 percent of active physicians with a MD degree in 2013, according to the Greenlining Institute. Not all the statistics are negative, though. In some ways, women are not only equal to men in medicine, but they’re making a bigger difference. For example, elderly hospitalized patients who received treatment from a female physician were less likely to die of their condition and less likely to be readmitted to the hospital than those who received treatment from a male physician, according to researchers from Harvard’s School of Public Health. If all physicians performed as well as female physicians, they would save 32,000 lives a year, say the researchers in the February 2017 issue of JAMA Internal Medicine. Various factors could be driving this difference. Studies suggest that female physicians are more likely than men to have patient-centered communication styles, follow clinical guidelines, provide preventive care and offer psychosocial counseling to patients. Without a doubt, women in medicine have come a long way, and with every step they’re making subtle but noticeable improvements to their field. 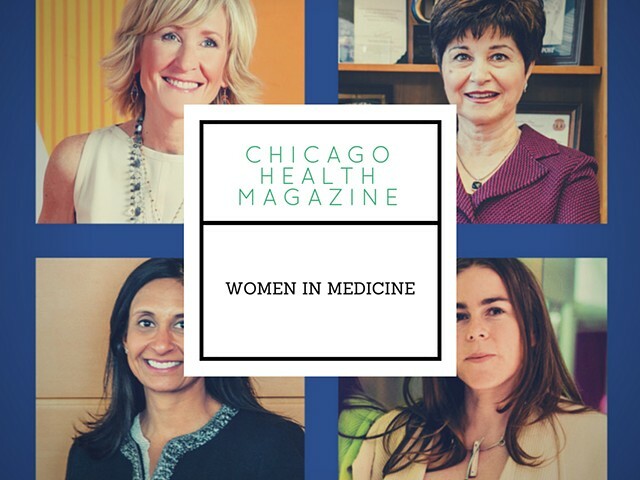 In this issue of Chicago Health, we take a look at four female leaders in Chicago medicine to find out how they’re driving change to improve patients’ lives. While working at a clinic early in her career, Joanne C. Smith, MD, met a girl with no legs. Undaunted, the girl had adapted; she used her arms and hands as “legs” instead. That incident stuck with Smith and inspired her career. Today, she serves as president and CEO of the Shirley Ryan AbilityLab in Chicago — a research hospital that U.S. News & World Report has ranked number one in the nation for adult rehabilitation. Like that little girl, Smith has never taken the expected route. While many physicians avoid the business side of medicine, Smith embraced it. After eightyears as a physiatrist at the Rehabilitation Institute of Chicago (the former name of the Shirley Ryan AbilityLab), she pursued her MBA at the University of Chicago, wanting to better understand the healthcare market. “I was eager to absorb everything I could about finance, marketing, organizational behavior and competitor analysis so that I could go back [to the AbilityLab] and accept greater responsibilities,” Smith says. Most of her drive to provide state-of-the-art care and cures, though, comes from patients. When Smith became CEO, “I listened to what they said they wanted — new research, new products, new discoveries. All of those words are code for ‘cures,’” she says. At age 9, Jyoti Patel’s father passed away from pancreatic cancer. From that moment on, Patel watched her mother become the family’s sole caregiver while maintaining an active career as a physician. “She was an incredible role model and inspiration — new immigrant, single mother, excellent physician. I am indebted to her — she really paved the road for me,” Patel says. Now director of thoracic oncology at UChicago Medicine and professor of medicine at University of Chicago, Patel takes a bench-to-bedside approach to medicine, learning from each patient and pushing for the best for them. “For years, we made incremental steps, but we’re coming to an era in which we’re making these giant leaps forward,” she says. During her training at Memorial Sloan Kettering Cancer Center in New York, Patel worked on clinical trials for a chemotherapy pill for lung cancer patients. “That was 2000, and now our learning curve has brought targeted therapy and immunotherapy to the bedside. It’s an exciting, dizzying time,” she says. But it’s not a perfect time. While more women than ever are entering medical school, Patel notes that they don’t have as many pathways to leadership positions as men do — or institutional support for work-life balance. That causes many women to put the brakes on their medical careers. “It’s a hard balance and often there are times when your foot comes off the accelerator. But I remind women early in their careers that it’s consistency and drive over decades that count,” Patel says. She focuses on prostate and bladder cancers — also called GU (genitourinary) cancers. She finds the field particularly exciting, because in some GU cancers, like testicular cancer, she can tell patients that they will be cured. In other GU cancers, life is being prolonged, she says. From the time she was in kindergarten, Hussain knew she wanted to be a physician. She grew up in Baghdad, Iraq, during an era when the culture encouraged academic success, regardless of gender, she says. Her medical school class consisted of roughly 30 percent women, and many of her professors were female as well. In addition to patient care, Hussain’s work with the next generation of oncology researchers and clinicians motivates her. She and her husband left Baghdad for the United States in 1980, weeks before the Iran-Iraq War, and she hasn’t looked back. Yet, she often shares with her mentees lessons she learned growing up in Iraq and training and living in the U.S.
For self-professed math geek Dana Edelson, MD, there wasn’t enough math in medicine. And so she decided to harness the power of data to improve patient care, including reducing cardiac arrests in hospitals. “A lot of people will say medicine is an art. To me, this brings math and science into it,”she says of Quant HC, the start-up company she founded in 2013. Quant HC’s main product, eCART, monitors patients’ vital signs and lab values and calculates the probability of having an adverse event, putting the patient in a color-coded zone from gray to red. If the patient reaches red, eCART triggers a rapid-response team, and a critical care nurse checks the patient. The product builds on a decade of Edelson’s research as a hospitalist at UChicago Medicine. She set out to study CPR quality, but when the medical center switched to electronic health records, Edelson gained a powerful glimpse into the big data behind patient experiences. “It became clear to me that in the patients we were studying, [cardiac arrests] could have been prevented in the first place. If you look at their charts, in the day or so before an event happened you can often see changes in vital signs or lab values,” she explains. Nine hospitals, including UChicago Medicine and Alexian Brothers Health System of AMITA Health, currently use eCART, and each reported a major patient save within a few days of implementing the tool.